Christine Neish with one of the guide dog puppies she helped prepare for a life of helping others. 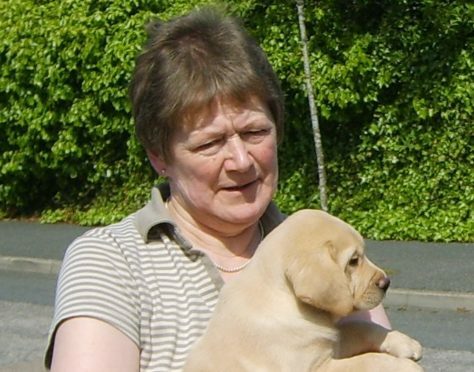 Christine Neish gave up countless hours preparing puppies for a lifetime of assisting people with sight problems, offering up her Aberdeen home to seven puppies for a year’s worth of walking and training each time. She died from ovarian cancer in April 2017, at the age of 69. Less than a year earlier, the Alford native was named local volunteer of the year during a national awards ceremony. And now, her name will live on through the Guide Dogs charity. A 14-month-old dog has been named Kirsty – Mrs Neish’s family name – and will soon leave her walker and embark on the next stage of training at the organisation’s Forfar base. About £2,000 was raised for the charity at her funeral, and Mrs Neish’s colleagues at the local branch amassed a further £3,000 to cover the £5,000 cost of naming the dog after her. Mrs Neish, who was married to husband William for 47 years, was also mum to sons Duncan, Gordon and Stuart. Mr Neish, a former Press and Journal reporter and council press officer, said the family had taken some comfort from the tribute. He added: “This is absolutely what she would have wanted, she was such a dedicated supporter of the charity. “She got involved because she had the time available and wanted to help others. “And, of course, she was a big dog lover. “It was sometimes hard handing the dogs back after a year, but we knew they were going off to do something very worthwhile. Pup Kirsty was recently a special guest at the annual meeting of the Aberdeen branch of the charity. The group posted a tribute to Mrs Neish on social media afterwards, along with some pictures of the welcome guest.